American Nightmare Joins The Humble Trove! Good evening Alan Wake fans! As Remedy is currently focusing on Crossfire 2 and P7, we haven't had much in the way of news about the AW series. 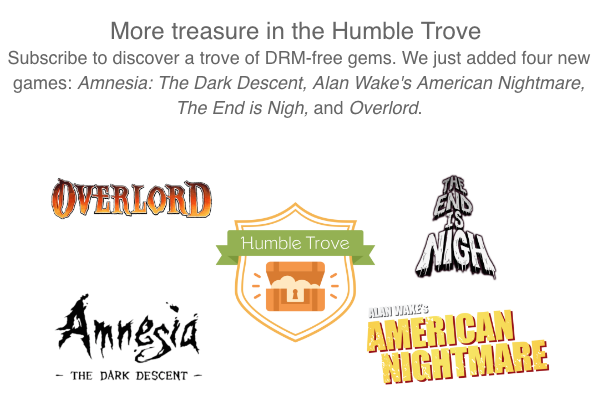 A little while ago though, The Humble Store announced that Alan Wake's American Nightmare (DRM-free) will be joining the Humble Trove. The Humble Trove is an online library of games that Humble Monthly subscribers can play in addition to getting new titles every month. American Nightmare joins games like Gone Home, Amnesia: The Dark Descent, Limbo, Trine and more. The monthly subscription costs $12 and the trove's catalog is constantly growing, making it a great way to try new games you haven't tried yet while giving to charity. Now this is also good news for Alan Wake fans in general as it's another way that the series is getting its name out there. The more people who try it, the bigger the fanbase will become leading to more fanfiction, fan art, and more energy and anticipation for a possible sequel. It also raises the chances of getting that sequel a little more as the established community grows. For more details on the Humble Trove, click HERE!